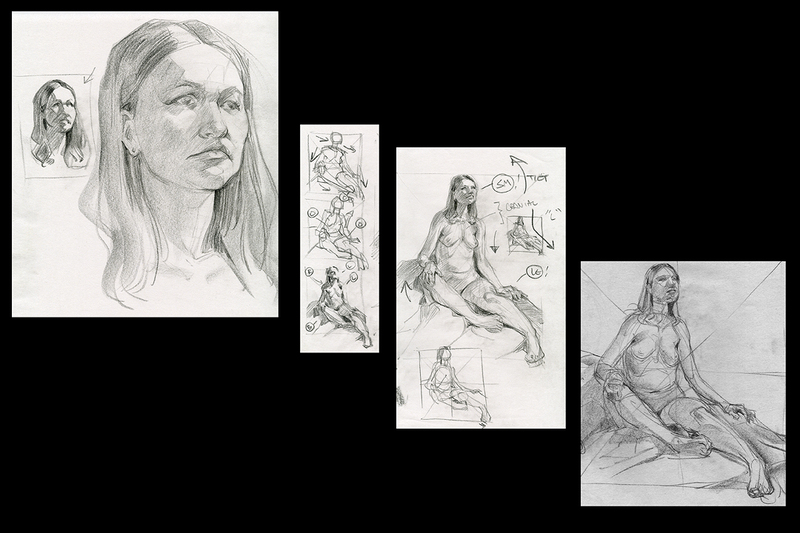 Ugh...I'm having an easier time laying down simple, decisive value treatments in my thumbnails (page, midtone, dark), but for whatever reason can't bring myself to press down as hard on the larger drawings. Perhaps it's because I spend more time laying in features and then don't want to risk demolishing them. In any case, today was a successful exercise in planning, but a failure in execution. Next time I'll take a bigger risk. time to get a big fat stick of soft charcoal and give that a go, or what i used to like using was a 1/2 inch hog brisle brush and a bag of sanded down charcoal shavings. Then use a kneeded eraser to rub out highlights. I've always thought supplies/technique mattered little compared to over-arching theory, but I suppose I could try working with less cumbersome media and just go back to using regular pencils and copy paper vs. drawing on large newsprint with waxy sticks and china markers. I think bold results can be achieved in any medium, though, and that what I'm suffering from is more psychological than it is technical. I overhear people at these sessions prattle on about fancy papers and paints and so forth, but when you look at their work, it wouldn't matter if they were using the best stuff available, it's so bad. Jon Diesta's work *is* neat. Thanks for sharing. The point i was trying to make was not to use these materials to make a nice drawing but to help you lay down your darks no matter how hard you are pressing. A way to trick your brain and maybe jump that hurdle. Ah, so you're suggesting I just go ahead and lay the dark in staight away?